Global Commodity Investments Limited (GCIL) was formed in February 2009 and specialise in Physical Precious Metal Investments, predominantly in the Gold & Silver Markets. GCIL consists of a group of highly experienced professionals who are dedicated to offering investors a superb level of service within these exciting markets. 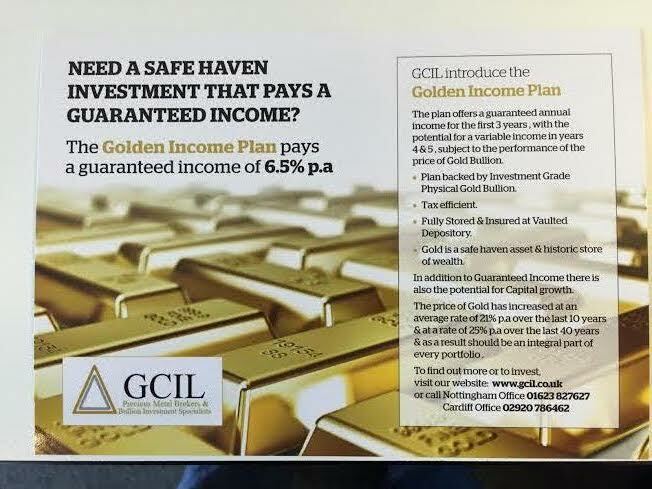 GCIL are highly confident in their ability to work with you in offering both an enjoyable and ultimately profitable experience within the Bullion Markets. Q What is Gold Bullion? Gold Bullion is the most commonly traded precious metal across the globe and is potentially the only element added to a portfolio that will truly diversify the collection of investments. Q What are the key reasons to hold Bullion? > Economic Forces: The forces that affect the price of bullion are often opposed to that of other asset classes. In times of uncertainty when investors are very wary of buying, for instance, equities, they favour gold in order to give exposure to a vehicle that is likely to benefit from turbulent times. This independent movement of precious metals to other financial assets can reduce overall portfolio volatility and contributes balance. > Preservation of Purchasing Power: Gold has traditionally performed well as a long-term store of wealth and purchasing power. This is commonly known as the inflation hedge. > Asset Allocation: Experts suggest that 8% to 12% of a portfolio should be allocated to precious metals. No matter what level of risk an investor wishes to take, every portfolio needs a secure foundation.